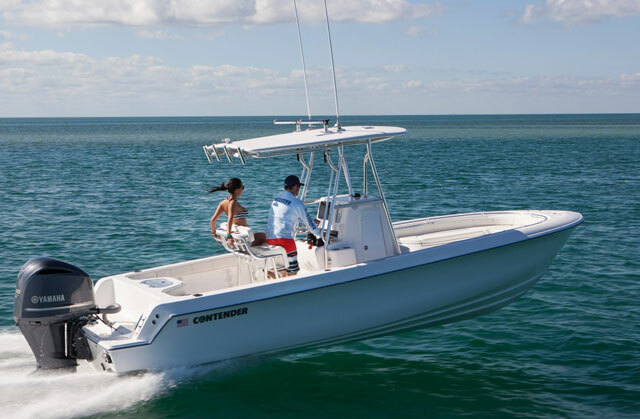 The Contender 25 Bay has the fishing attitude of a bay boat, but the performance and seakeeping attitude of a Contender offshore fishing machine. 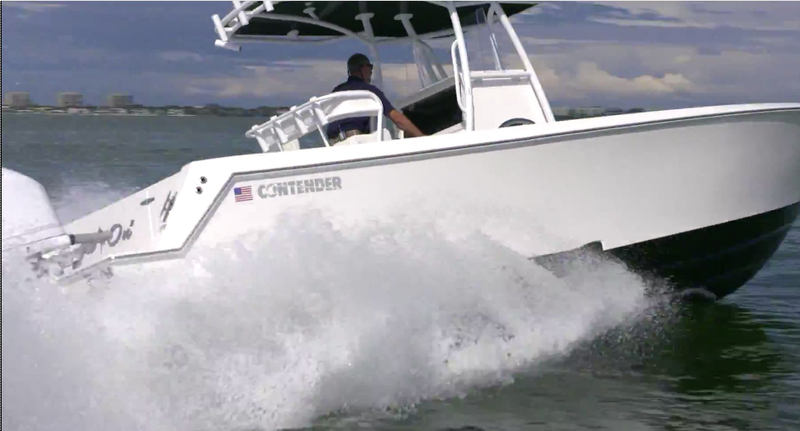 The bread and butter for Contender Boats has always been deep-V offshore center console fishing boats like the Contender 30 ST, and the 28 Sport. For this company, building a bay boat might appear like more of an afterthought, than a priority. But as we all know, appearances can be deceiving. 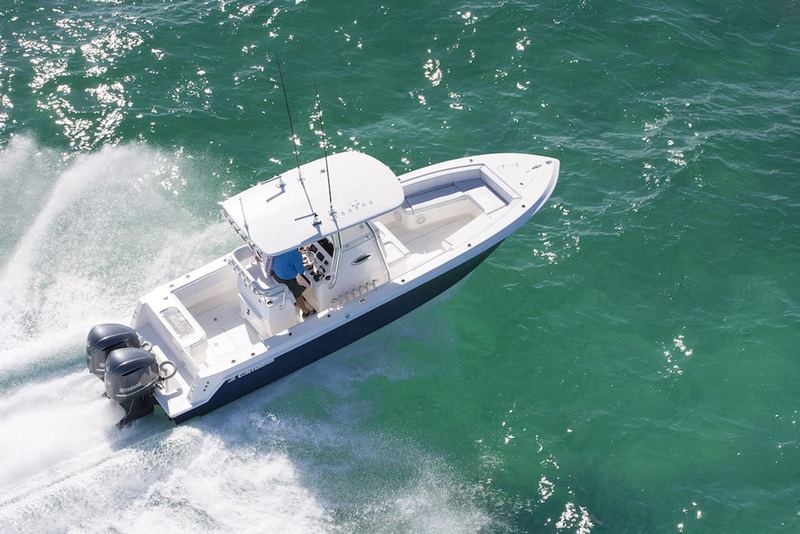 And after spending a full day fishing on the Contender 25 Bay, both inshore and 15 miles out in the Gulf of Mexico, it’s clear to us that Contender applied its usual fishing boat focus to this model—tweaked only to match a different kind of fishing. 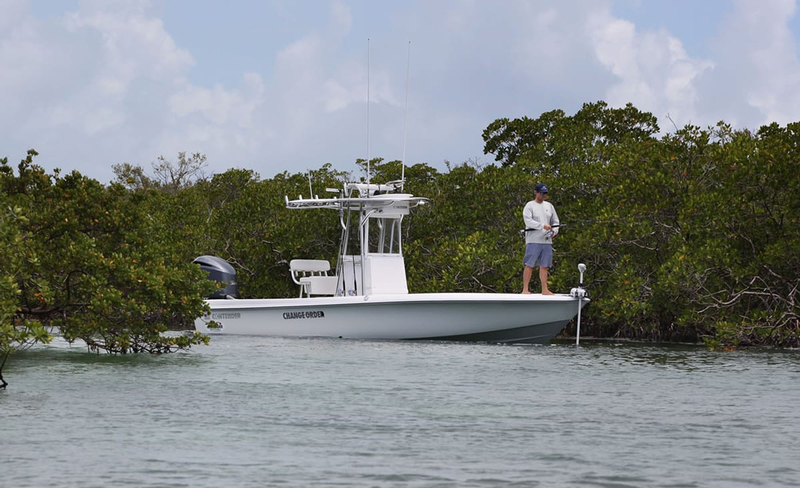 Join us for a quick look at the 25 Bay, as we fish-test it first-hand. The most radical difference between the 25 Bay and other Contender hulls is the transom deadrise. An extreme 24.5-degree deep-V is their usual modus operandi, and while this is great for offshore boats, it doesn’t offer the stability needed for casting from elevated decks and walking along gunwales. Deeper V’s also increase draft, and it’s important for bay boats to be able to creep into the shallows where redfish and speckled trout roam. 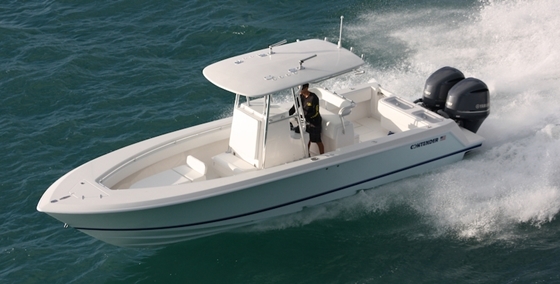 (Read Bay Boat Battles: What Makes One Better than Another, to learn more about the traits that are commonly valued in a bay boat). So Contender designed the 25 Bay with a 15.5 degree deadrise. That’s still pretty steep by bay boat standards, and it does a good job of splitting open waves, but it also results in a fairly stable platform with just one foot of hull draft. Yes, it was calm when we tested this boat. Even so, there are always waves when you run beyond the sight of land and the Contender never slammed or threw spray, even at fast cruising speeds. Bay boats need to be attuned to a different sort of fishing than offshore boats, but Contender hit this mark in the bull’s-eye. Another big difference is, naturally, the fore and aft casting platforms. Deep-V center consoles aren’t commonly decked, but the 25 Bay most certainly is. And thanks to the boat’s rather large (relatively speaking for bay boats) footprint, these casting platforms are quite big. As we discovered while tossing jigs in the shallows, there’s room for two people to cast from the bowdeck, two to cast from the aft deck, and two more anglers can pitch their lures from the cockpit. As is common for this genre of boat the aft deck also houses a livewell (two in this case), stowage compartments, and batteries. It has the expected pair of flip-up jump seats, too, though the ones on our test boat were excruciatingly difficult to put up and down. The aft deck is roomy enough for a pair of anglers to pitch their lures. The foredeck is dedicated to one very large stowage compartment and an anchor locker, and we noted that aside from the electric trolling motor installed on our test rig, the foredeck was completely snag-free—a trait fly fishermen always like. Performance, on the other hand, is Contender through and through. 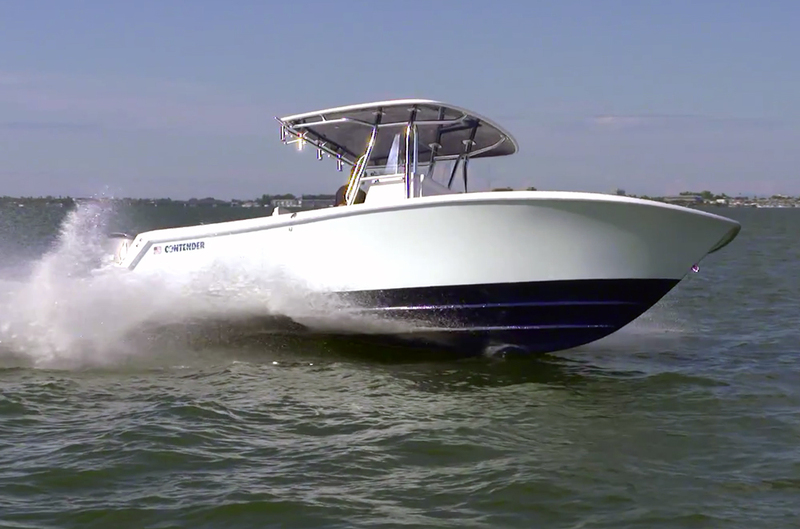 The 25 Bay has a twin-stepped hull that posts excellent efficiency, making over four miles to the gallon at 35 MPH. It will be tough, however, to go that slow. Zipping across the bay at 45 MPH (4500 RPM) is much more fun, and there’s always the temptation to nail the throttle and crank it up to the 60 MPH mark. Those who want to get into the skinniest of the skinny water hotspots probably won’t gravitate toward the 25 Bay, which does require a few inches more water than some shoal-draft fishing boats. 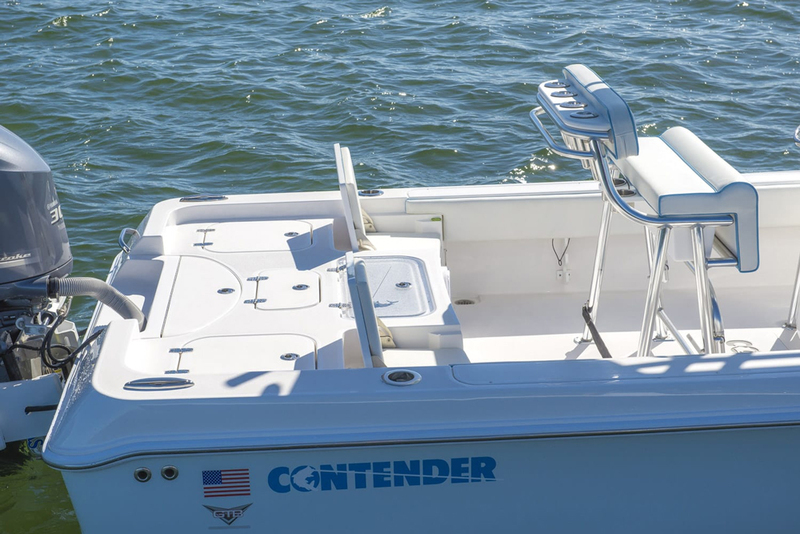 But between the capable hull, the ability to rig with a T-top buggy seat, and the extensive casting platforms, the Contender 25 Bay is one of the most versatile fishing machines around—and it proves that Contender’s focus goes well beyond offshore deep-V center consoles. 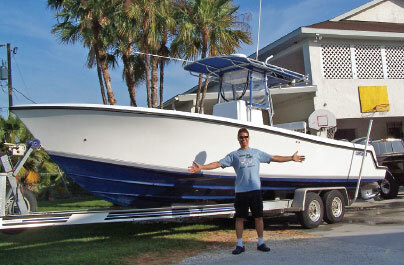 Other Choices: Another large bay boat that can handle a huge load of anglers is the Pathfinder 2600 TRS. If you want to place more emphasis on comfort, you might also consider boats like the Grady-White 251 Coastal Explorer, or the Shearwater 26 Carolina. 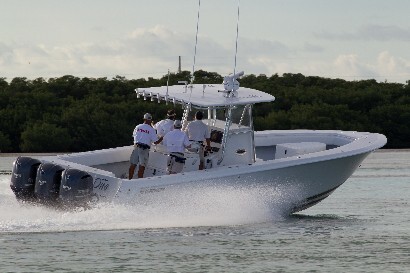 For more information, visit Contender Boats. See Contender 25 Bay listings.